Can’t get enough of Whale Wars on Animal Planet? Then you're in luck. On April 27 at 8 pm the two hour premiere of Whale Wars, Viking Shores will air. The five part series will eventually be seen each Friday at 9 pm. The campaign takes place in the Faroe Islands located in the North Atlantic, between Scotland and Iceland. The people of the Faroe Islands are self governing and descendants from the Vikings. Every year pilot whales are herded into the shallow water -- in an event called the Grind -- by Faroe inhabitants. The whales are then killed for their meat. 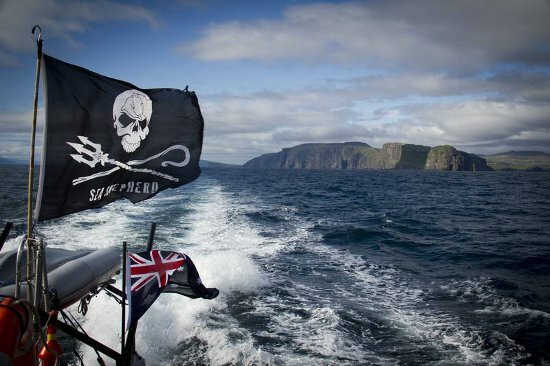 A Grind event can happen at any moment, so for this campaign Sea Shepherd is taking a new approach. Not only will they work to protect the whales in the water but they will deploy a covert team of members on the streets and utilize an ultra light aircraft. The new aircraft is equipped with an acoustic device to attempt to drive the whales away from the island. Paul Watson, founder and president of Sea Shepherd Conservation Society, has been protesting the Grind since 1986. He has stated "Justice takes precedence over the law. No law that [the Faroes] can pass is going to justify what they're doing to those whales," says Watson. "We have to constantly remind the Faroese that the outside world is watching them." Maryland John lives in Maryland where he works as a sales manager. John and his wife Eileen’s pursuit to achieve optimum health combined with a desire to send a strong message to factory farming, inspired them to examine what they put into their bodies. Now a vegan, John has great admiration for groups like Farm Sanctuary and hopes to influence others by sharing his positive experiences.